Photo courtesy: Joe Tripiciano/Oceanside Adventures. 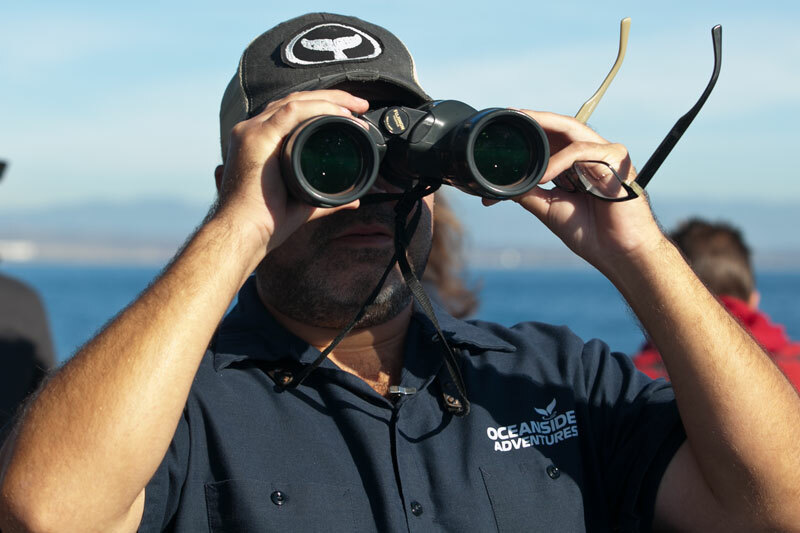 Oceanside CA—Whale watching season is in high gear with Orcas spotted off Carlsbad and grey whale sightings up and down the coastline. 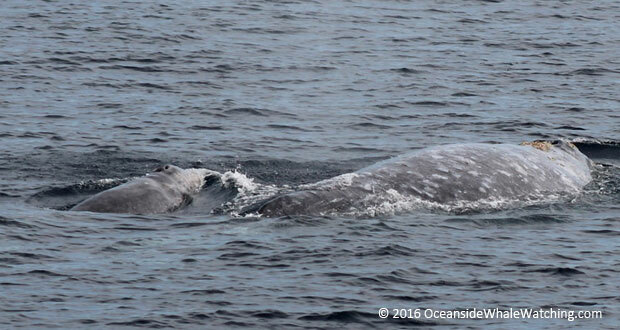 Last week, Oceanside Adventures reported their first sighting in the 2016-17 season of a newborn grey whale calf and its mother outside the Oceanside Harbor. Oceanside Adventures began running whale watching trips from Oceanside Harbor in 2015. Last week, I had the opportunity to take my first ever whale watching trip with Oceanside Adventures. Not long after my reservation was made, I received a confirmation email which contained instructions on what to wear, warm, layered clothing is best. It is always much cooler (10-15 degrees) on the ocean than in the harbor. The confirmation email also includes what not to bring; No personal food, drinks, ice chests, coolers etc, plus other tips and guidelines along with directions on how to get to the harbor from Los Angeles and San Diego. Their vessel is a 50 foot, wheelchair accessible, one level, fast Catamaran built by Cooper Marine in Florida with covered and uncovered seating. “The Catamaran is the best kind of boat for trips like this,” said Steve Burkhalter, the Captain for our two-hour excursion. 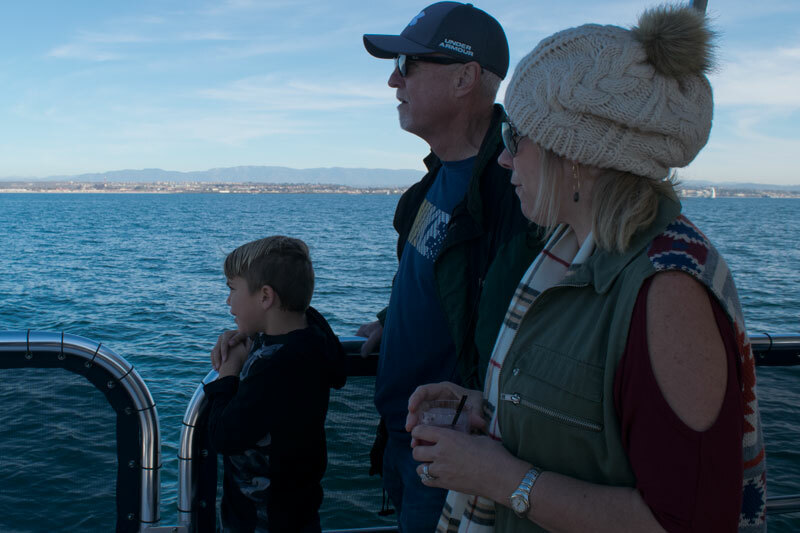 “The boat has a nice wide deck giving the passengers a better way to view the wildlife.” The Captains for Oceanside Adventures are certified naturalists and can answer most questions about the wildlife you may see on your trip. The boat, loaded with forty-seven passengers, departed at noon. Oceanside residents who also happen to be volunteers with OPD, Dave and DeAnn brought their 8-year-old grandson, Noah. “He is really excited about this trip. He has never had the chance to see whales or dolphins before,” said Dave. Deidre, who along with her husband, brought three kids, one of their own and two foster children, with them from Arizona. “This is our first vacation in California. We just Googled stuff to do in Oceanside and this came up. The kids are excited about the boat ride and seeing dolphins,” said Deidre. 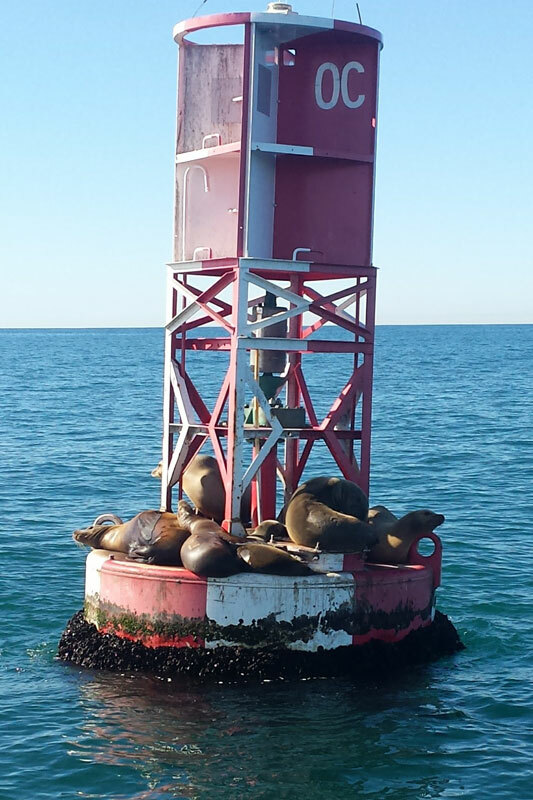 Our first stop was a buoy just outside the entrance to the harbor where a group of California Sea Lions were warming themselves in the sun. From there it was a cruise north towards Dana Point in search of whales and dolphins. As we were cruising along, I remarked to another passenger about how quiet and smooth the boat was while cutting through the waves. I didn’t know what quiet was until another passenger said he had spotted a dolphin, just beneath the surface, off the port side. The engines were cut and we came to a dead stop as did all the conversations with everyone onboard focusing their eyes and attention on the water. Aside from ‘Peace Train’ by Cat Stevens coming from the boat speakers near the bar, there was silence and a lot of anticipation. The anticipation turned to disappointment and unfortunately for Noah, the family from Arizona and the other forty-one people aboard, that was as close as we came to seeing any whales or dolphins. Like fishing, there is skill involved in knowing where and what to look for when you go whale watching but luck is involved too and sometimes you just don’t get lucky. Nevertheless, the trip was very enjoyable and the disappointment was tempered when Joe handed out vouchers, to everyone on board, for a free trip to try again. The vouchers have no blackout dates and never expire. “It doesn’t happen a lot but when we don’t see anything on a trip, we hand out the vouchers. We like it when people come back.” said Captain Steve. The trips are approximately two hours in duration with current departures at Noon and 2:30pm. Group Rate for 15 or more $5 off each ticket. On the first Saturday of the month, 5-6:30pm, Oceanside Adventures offers the ‘Oceanside Harbor Wine Cruise’. For $39.00 per person (21-years-old +), take a 90-minute evening cruise through the harbor featuring an appetizer platter and three tastes of wines from the Beach House Winery. In February, to celebrate Valentines Day, there are two Wine Cruises, one on the 4th and again on the 11th. Also in February, as part of Oceanside’s second annual Valentines Week celebration, Oceanside Adventures will be offering discounted ticket prices from the 2nd-13th (excluding Saturdays). $29.00 per adult, $19.00 children 3-12 and $10.00 for kids 2 and under. On Valentines Day, take the two-hour ‘Romance Cruise’ which includes champagne and chocolates. The price is $55.00 per adult (21+). For more information about Oceanside Adventures, schedules, Charters, and to make reservations, visit OceansideWhaleWatching.com or call 888-507-1130.